Between the crowded stores and long lines, shopping online becomes especially appealing during the holiday season. And while e-commerce purchasing is convenient for consumers, it can be particularly problematic for retail supply chains. The Washington Post's Sarah Halzack recently revealed that companies are finding it difficult to adequately fulfill "click-and-collect" orders, the option that allows customers to place an order online then pick it up at a local store. There are many benefits to retailers offering this feature. In addition to reducing shipping-associated costs for both the consumer and company, it provides people with a quick and convenient platform on which to shop online without sacrificing the businesses' in-store traffic. According to Halzack, research conducted by Forrester Research revealed that roughly 42 percent of online consumers utilize the "click-and-collect" feature. Furthermore, a StellaService report showed 25 percent of these type of orders faced issues during the holiday season. Many of the problems experienced with click-and-collect orders could be attributed to lack of inventory management and miscommunication along the supply chain. "It's like the 12-step alcoholic program. We're on step one. We realize we have a problem," WD Partners Retail Strategist Lee Peterson told Halzack. A retail and consumer specialist at PwC, Steve Barr, added that, "The idea of 'buy online, pick up in-store' is a great idea. But today it's more aspirational than it is achievable." The holidays aren't the only time when these difficulties arise. JDA Software Group recently found that, over the last year, approximately 40 percent of click-and-collect shoppers weren't completely satisfied. This struggle contributes to the ongoing complexity of retailers having to adjust supply chain operations to meet the rapid growth of omnichannel purchasing. Research conducted by PwC indicated that multichannel shoppers are increasing and retailers are struggling to keep up with them. The report suggested that there is a great need for businesses to align supply chain operations with consumers' expectations. The source added that, in order to address this, supply chains must implement digital technologies. Though it may be difficult to accommodate the heavy influx of click-and-collect orders, it is not impossible. The retail supply chain consultancy company Kurt Salmon conducted a study that found Macy's, Lowes and Target were some of the best major retailers at fulfilling these types of orders, Halzack reported. Target and Wal-Mart have both reallocated and increased the number of assigned staff members to provide more efficient customer service. Another key strategy is rethinking the design of stores. For example, Halzack pointed out, Best Buy started expanding in-store counter space for click-and-collect shoppers and Kohl's created parking spaces solely for pick-up purchases. In order to improve the supply chain inefficiencies of major retail companies, better inventory management is needed. Enhanced analytics and increased visibility could make determining which and how much of products to offer consumers easier and more accurate for retailers. 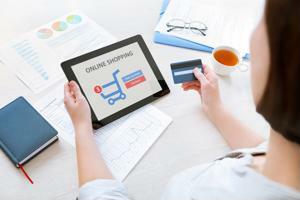 Considering the volume of e-commerce shoppers will only continue to increase, it is imperative companies prioritize the optimization of inventory and supply chain management.